There are 17 Assisted Living Facilities in the O Fallon area, with 2 in O Fallon and 15 nearby. The average cost of assisted living in O Fallon is $3,162 per month. This is lower than the national median of $3,346. Cheaper nearby regions include Shiloh with an average starting cost of $2,750. To help you with your search, browse the 60 reviews below for assisted living facilities in O Fallon. On average, consumers rate assisted living in O Fallon 4.8 out of 5 stars. Better rated regions include Waterloo with an average rating of 5.0 out of 5 stars. Caring.com has helped thousands of families find high-quality senior care. To speak with one of our Family Advisors about assisted living options and costs in O Fallon, call (855) 863-8283. As one of the fastest growing communities in the St. Louis metro area, O'Fallon, Illinois, is host to a diverse group of residents ranging from personnel stationed at the nearby Scott Air Force Base to families who have lived in the area for generations. Only 10.4 percent of the nearly 30,000 residents are age 65 or older, and there are two assisted living facilities in O'Fallon to serve them. Fifteen more are located in nearby communities. In O'Fallon, as in the rest of Illinois, these facilities must be licensed by the Illinois Department of Public Health. They must also meet certain guidelines, such as maintaining 24-hour security measures and an emergency alert system for residents' safety. The overall cost of living in O'Fallon is on par with the Illinois state average of 102 and slightly above the U.S. average of 100. Grocery costs are generally lower than average at 92.9, which may help seniors on a fixed budget. However, health and transportation costs are slightly above average. Illinois tax policies are generally favorable for seniors. Retirement income, including Social Security, pensions and withdrawals from retirement accounts, is not taxed by the state. Groceries, medicines and other essential items are still subject to sales tax. As part of the St. Louis metro area, O'Fallon residents' public transportation needs are handled by Metro Transit. This includes MetroBus and MetroLink rail service, both of which have routes in and near O'Fallon. Seniors are eligible for half-price fares if they apply in advance. The crime rate in O'Fallon is somewhat high, which may make it difficult for seniors to feel safe traveling alone. The annual crime rate is about 23 crimes per 1,000 residents. However, it is generally safer than the Illinois average, with residents having a 1 in 542 chance of becoming the victim of a violent crime in O'Fallon, while residents of Illinois in general have a 1 in 228 chance. The O'Fallon area is home to world-class medical facilities, including HSHS St. Elizabeth's Hospital, in the event of medical emergencies or illness. St. Clair County, which includes O'Fallon, has been given a C rating for air quality by the American Lung Association. The air quality is generally decent, but seniors with respiratory concerns may need to be careful on high-ozone days. Assisted Living costs in O Fallon start around $3,162 per month on average, while the nationwide average cost of assisted living is $4,000 per month, according to the latest figures from Genworth’s Cost of Care Survey. It’s important to note that assisted living rates in O Fallon and the surrounding suburbs can vary widely based on factors such as location, the level of care needed, apartment size and the types of amenities offered at each community. 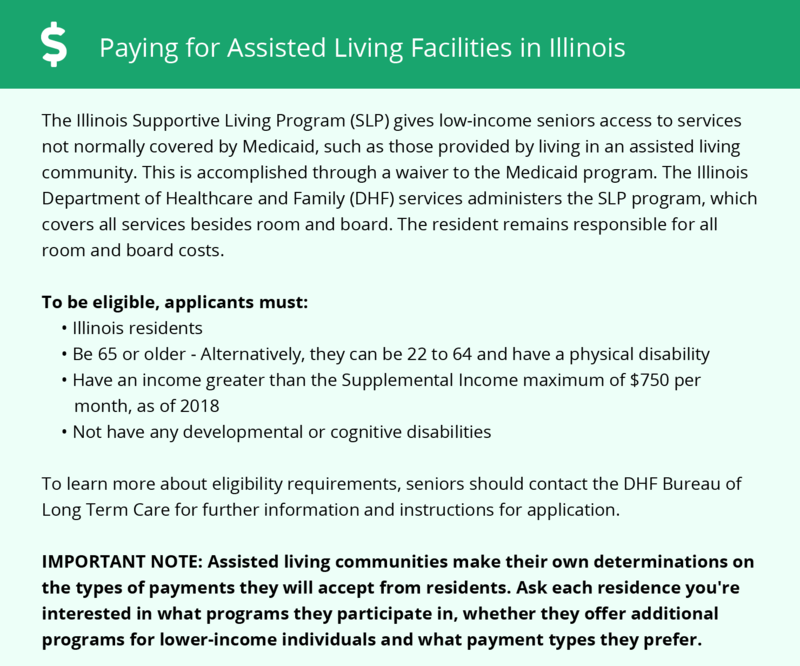 Eligible seniors may qualify for the Illinois Supportive Living Program Medicaid waiver or the Community Care Program to help pay for assisted living services. To see a list of free assisted living resources in O Fallon, please visit our Assisted Living in Illinois page. O Fallon-area assisted living communities must adhere to the comprehensive set of state laws and regulations that all assisted living communities in Illinois are required to follow. Visit our Assisted Living in Illinois page for more information about these laws.